Here’s why you should study 71 pages dedicated to the art of making pie: The writers of the new cookbook, The Four & Twenty Blackbirds Pie Book: Uncommon Recipes from the Celebrated Brooklyn Pie Shop, have been baking pies since they were old enough to stand. Sisters Emily and Melissa Elsen grew up in Hecla, South Dakota (population: 230), learning how to make tender, flaky, handmade crusts and seasonal fillings from their mom and grandmother at the family diner. The sisters moved to New York to pursue respective careers in photography and finance, but the pull of pie proved too strong. 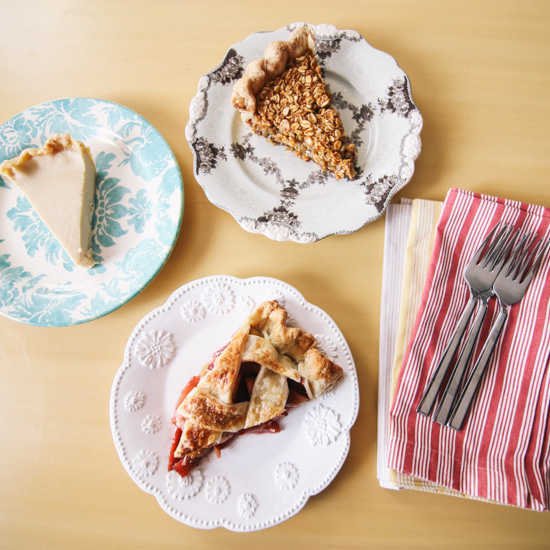 In 2010, private baking gigs turned into a full-time operation: their beloved Brooklyn pie shop and café, Four & Twenty Blackbirds. Fast-forward three years, and they’ve created this gorgeous new book to advance their cause, that the best pies should be made with seasonal ingredients (sourced locally, when possible). With more than 60 recipes and beautiful photos by Gentl and Hyers, the book is a great tool for even novice pie makers. And yes, it includes a 71-page intro to the basics of pie making, from the tools you need, to detailed diagrams of how to make a basic butter crust. I attempted three pies from the book; going along with their hyper-seasonal philosophy, I stuck with recipes in the fall section. I wanted to try a variety of techniques, so I chose a fruit pie with a lattice top (the intriguing Plum Fig Pie), a custard pie with a cornmeal crust (Maple Buttermilk Custard Pie), and because I’m a chocolate lover, one of their best sellers, the Black Bottom Oat Pie. The recipes were easy to follow, though they’re all quite labor-intensive, and—if you’re a pie novice like me—it’s important to read the intro thoroughly before attempting these recipes. I followed their recipes to a T, and each one turned out beautifully. The all-butter crust is tender and easy to work with (provided you give it ample chilling time) and the apple cider vinegar adds a lovely tang. The cornmeal crust is slightly harder to work with, but the flavor is fantastic—especially in the Maple Buttermilk Custard Pie. For some reason, both the pies I made with liquid fillings ended up having an entire cup of extra filling; I just filled the pie crusts as much as possible and discarded the rest. Also, just one more testing note: The Elsens recommend using 9-inch Pyrex glass pie plates. I had a hard time finding these (they seem to all be 9.5 inches now) so I tested a couple of recipes using the 9.5-inch, and one using a 9-inch ceramic-glazed stoneware dish. Both worked just fine. I can’t wait to try out more recipes from this book. I came away feeling much more confident in my pastry skills, almost as though I had attended an intensive pie making class. Click through the slideshow for a few great tricks I learned from the book.